I've had curly hair my whole life. I use to hate my natural curls when I was younger because I didn't know how to tame my unruly mane. I would deal with stubborn crunchy, frizzy, ramen looking dry damage locks for ages! Despite the dozen of hair styling products I used I could never find one that worked well with my hair type, until now! I was browsing though the Birchbox site when I came across Miss Jessie's Original hair products. I've received a few of their products in my boxes before but never tried any of them. I was immediately drawn to the Pillow Soft Curls because of the name and cute packaging. It was kind of pricey ($22) but I used my Birchbox points that I'd been collecting and decided to go ahead and spurge. I'm so glad I did because it's the best styling cream I've ever used! "The name says it all. 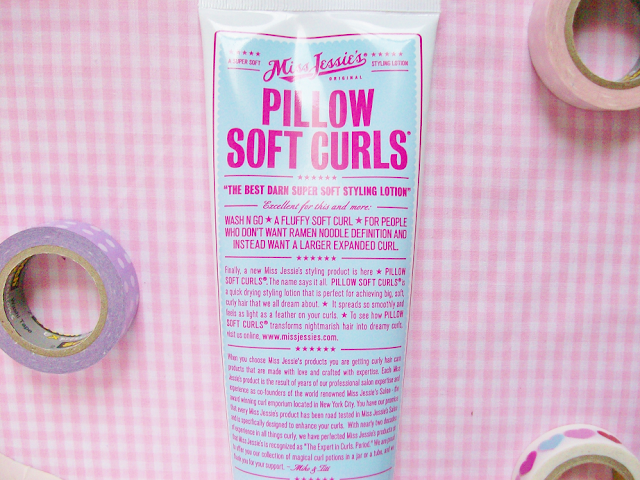 Miss Jessie's Pillow Soft Curl is the new styling lotion that borrows fabric care technology and marries it to haircare. It is perfect for achieving static-free, big, soft, curly hair that we all dream about." After washing my hair I apply this light weight gel cream on damp hair. I use a wide-tooth comb to evenly spread the product from root to ends. The cream itself it light and doesn't weight down your hair, it also smells incredible! Once fully dry, you are left with beautiful non-crunchy, sticky or greasy looking curls. You basically get soft fluffy pillowy curls! My only complaint is the price. I'm not a huge hair junkie so spending $22 on a tube of curling cream is kind of ridiculous to me. I've probably never spent more then $10 dollars on any hair styling products. But since it works really well with my type of hair I would repurchase over and over again! If you have natural curly or wavy hair, yes! This product will truly amaze you and completely change your life, at least your hair's. i use this sporadically. But, the day after my hair has dryed. I get some major itchy scalp. I do have dry hair. But the extra dryness is unbearable.